Though crossed by caravans and Covenant troops going to and from Cyrodiil, this wild region of eastern Hammerfell is a virtual no-man's-land. It's anchored on the east and west by the towns of Elinhir and Dragonstar. Craglorn is a region situated in northeastern Hammerfell between Bangkorai and Cyrodiil. 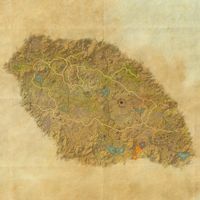 The zone can be entered at any level via the gate in Bangkorai, and it is also possible to travel to Craglorn via cart from the Alliance capital cities, Elden Root, Mournhold, and Wayrest. The main storyline revolves around the disappearance of the constellations from the sky. 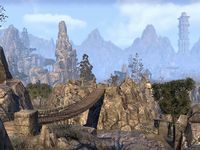 Originally designed as a Veteran-only 4-player Adventure Zone, Craglorn was overhauled in the One Tamriel update and is now a hybrid zone containing both solo and group content, open to players of any level. Areas involved with the zone's main storyline can all be tackled solo, as can the majority of the overworld. "Group Areas" are denoted with a plus sign on the world map and are aimed at groups of 2 to 4. Craglorn also contains several 12-player trials, as well as the 4-player Dragonstar Arena. Craglorn is split into three regions. Lower Craglorn comprises the two in the south of Craglorn, centered on the town of Belkarth. Upper Craglorn lies to the north, with the town of Dragonstar at its western end. Access between Upper and Lower Craglorn is by a rocky pass in the west, or through a sundered Iron Orc barricade in the east. Places with a plus sign + on the icon are designed for groups. Some delves in Craglorn are actually Group Delves, which are instanced[verification needed — still instanced?] and aimed at groups of 2 or more. Delves related to the main storyline function normally. These locations were originally listed as Group Events, but now function similarly to normal Group Bosses. Aside from The Shattered and the Lost and The Corrupted Stone, all story quests can be tackled solo. All side quests (aside from Gem of the Stars) are aimed at groups of 2-4 players, as are the two aforementioned story quests. Trial quests are for groups of 12. Denotes an exclusive path or quest. Only one of the connected quests can be completed. Denotes a quest which is part of the main chain. Denotes a quest which is required for Craglorn Completist. Denotes a quest which is required for Celestial Investigator. Denotes a quest which is required for Serpents and Secrets. Denotes a pointer quest which is part of the main chain. Denotes a pointer quest which is on an alternate path. The Star-Gazers: Travel to Craglorn to aid the Star-Gazers. The Corrupted Stone: Gain access to the Warrior's Apex Stone. The Shattered and the Lost: Investigate two Altmer claiming to be aspects of the Mage. The Time-Lost Warrior: Return Titus Valerius to his own time. The Seeker's Archive: Uncover the secret in the ancient library. Supreme Power: Free Elinhir from the Blackcaster Mages. Gem of the Stars: Exchange a blackened gem for knowledge on the Celestials. Message Unknown: Exchange a stone carving for knowledge on the Celestials. Strange Lexicon: Exchange a Dwemer lexicon for knowledge on the Celestials. Iron and Scales: Avenge the Iron Orcs by striking back at the Scaled Court's minion. Taken Alive: Find Scattered-Leaves' missing guards in the Valley of Scars. Falkreath's Demise: Lift the siege of Falkreath to save the city's inhabitants. Pledge: Bloodroot Forge: Prove you are truly Undaunted by clearing Bloodroot Forge. Pledge: Falkreath Hold: Prove you are truly Undaunted by clearing Falkreath Hold. 5 items: When you deal damage, you cause the enemy to take 10% additional damage from the next attack. This effect can occur once every 4 seconds. 5 items: When you deal damage with a Weapon ability, you have a 20% chance to deal an additional 46-4000 Flame damage. This effect can occur once every 2 seconds. 5 items: Increases the damage you deal with bleed damage over time effects by 20%. 5 items: When you take damage while under 50% Health, you summon a preservation of nature around you for 5 seconds. Any damage you take from enemies outside of the preservation is reduced by 50%, and the first time an enemy tries to enter the preservation they are knocked back 5 meters. This effect can occur once every 45 seconds. 2 items: When you heal a friendly target that is under 50% Health you conjure a pool of quenching blood underneath them, which soaks up an enemy placed effect instantly and heals all friendly targets in the area for 348-30000 Health over 6 seconds. This effect can occur once every 35 seconds. 2 items: When you deal damage, you have a 15% chance to create either a ring of fire or ring of molten earth around you for 10 seconds, which deals 11-1000 Flame damage or 11-1000 Physical damage every 1 second. Standing within the ring grants you 2-200 Spell Damage or 2-200 Weapon Damage. This effect can occur once every 15 seconds. 5 items: Gain Minor Mending at all times, increasing your healing done by 8%. 5 items: While you have a Destruction Staff equipped, your Max Magicka is increased by 27-2400. 5 items: Enemies you damage with fully-charged Heavy Attacks are afflicted with Minor Vulnerability for 10 seconds, increasing their damage taken by 8%. 5 items: When you die, you instead turn into a statue for 3 seconds. While a statue you are immune to all negative effects but can still be healed. This effect can occur once every 20 minutes. This page was last modified on 26 August 2018, at 23:14.